Admittedly its a little early for the Christmas decor. Now's the time though to get your craft on and get things ready. Two of my nephews spent the night last night and it seemed like the perfect occasion to start a craft for the Christmas season. 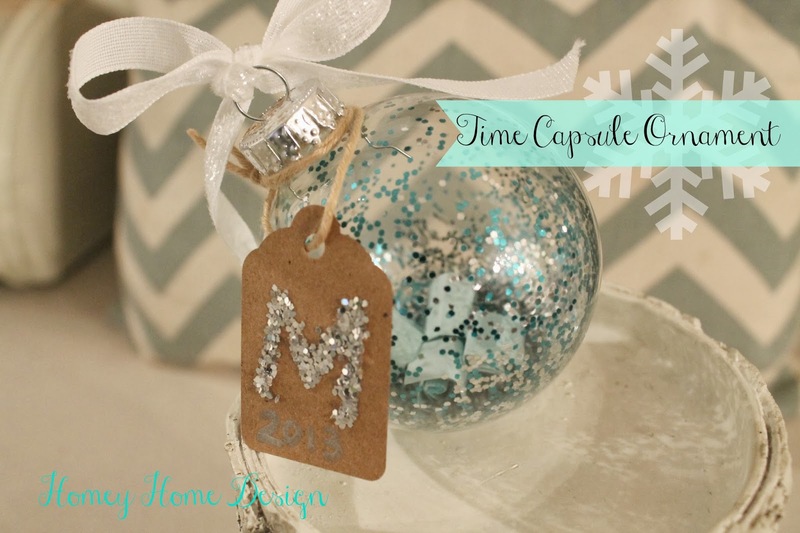 We made 'time capsule' ornaments. They turned out really cute and were easy to do. This is a great way to reflect on the year past and remember some of the things you did that were great memories for your family. We started with some clear glass ornaments. I had the kids write on slips of paper, things that they were thankful for or great memories from this past year. Once they had their slips written, I rolled them up and dropped them into the ornament. Then the kids added glitter. To the ornament. And the floor. And their hair. And their clothes. Once this part was done, I put each of their initials on a tag in glue and covered the glue with glitter. With a silver sharpie I added the year to the bottom. I wrapped this string around the top and added a white glitter bow. Easy Peasy! Once the tree is up I will show you how it all come together. For now, I hope you will try this easy project.